Beautiful mosaics are all over Fes. As we drove into the Moroccan city of Fes, it was not unlike some other cities we had been to. Everything changed though as we entered the medina. Without talking a man whipped up our suitcases into a wheelbarrow to take our bags along the bumpy streets beckoning us to follow him. Hanging out in the market in Fes. Dodging donkeys, trinket sellers and smelling the spices we knew we were in for a truly exotic stay among the darkened alleys. 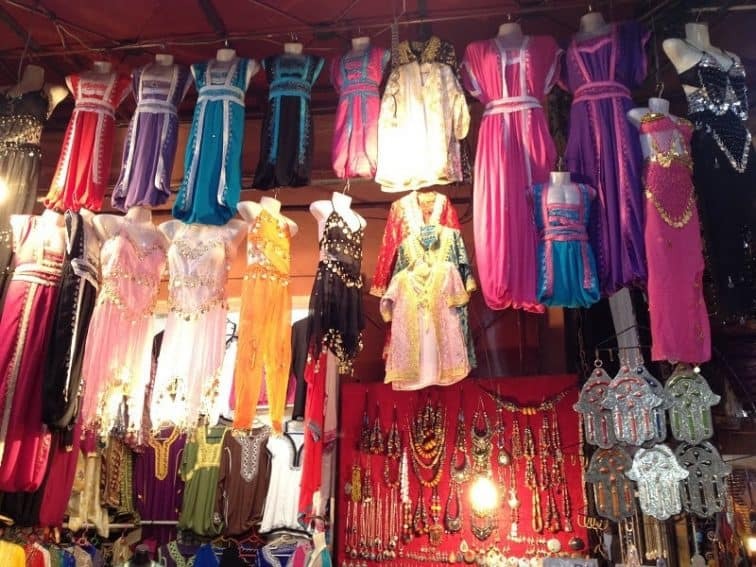 It’s full of color, billowing sheer curtains, perfumes, fountains and bustling bazaars. It’s an exotic and intoxicating mix of snake charmers, fresh mint teas, magical carpets and craft weavers with the hard-working donkeys dragging their loads up the sometimes-steep inclines in the medina. It is a world heritage site and an exquisite location so close to Europe. We couldn’t believe we are finally in Northern Africa. Colorful children's clothing in the market. Fes is probably best known for their iconic hats. The red, tasseled hats that have been worn from the Byzantine era and still worn regularly in Fes. But Fes has a lot to offer. Colored cushions enticed us many times to just sit and watch the passing parade, eating local tagines, with the locals smoking hookers and drinking strong coffee. The smell of the spices and pastries wafted along the cobbled alleyways with the locals plying their wares in the bazaars. It took us back centuries to medieval times. Haunting calls to prayer echo through the medina that are a fascinating blend of Moorish architecture. Our favorites are the fabulous tagines full of chickpeas, fish, vegetables, and meats (if you eat it) that are mouth-watering. Lentil salads, tabboulehs, hommos, sweet pastries served from market trollies, even local pizza. We ate in the markets, off the street and in the Medina’s without any problems with upset tummies. Breakfast was sensational with local honey and goat’s yogurt with fresh dates and flatbreads, yum! 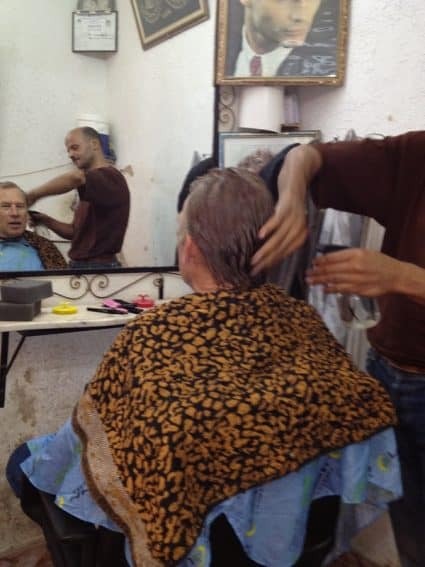 Getting a very thorough haircut in the Medina in Fes. Traditionally no cutlery was used and it’s wonderful to forget how many carbs we were eating and use our bread like the locals to scoop up the delicious sensual delights served to us at each meal. Markets here are a shopper’s dream. They sell everything from leather goods including very funky Moroccan slippers to silver jewelry and clothing. Beautiful stained-glass light shades that send colors swirling around a room are both for sale and in the accommodations, and each place we stayed had several colored window panes that created beautiful light shows. They are difficult to pack in your luggage but well worth it when you have such a beautiful light display at home. Aladdin lamps, soft leather goods in a kaleidoscope of colors and assorted silver goods are available in many stalls. We even managed to get a couple of tagines and beautiful ceramic bowl into our suitcases to bring home for ourselves and for gifts! Every time I cook in my tagine, I am transported back to those wonderful times in Fes. Make sure you bargain over a cup of mint tea, as prices start ridiculously high sometimes. The vendors can also be persistent so feel free to say no if the price remains too high. I usually started at about a third to a half of the asking price. 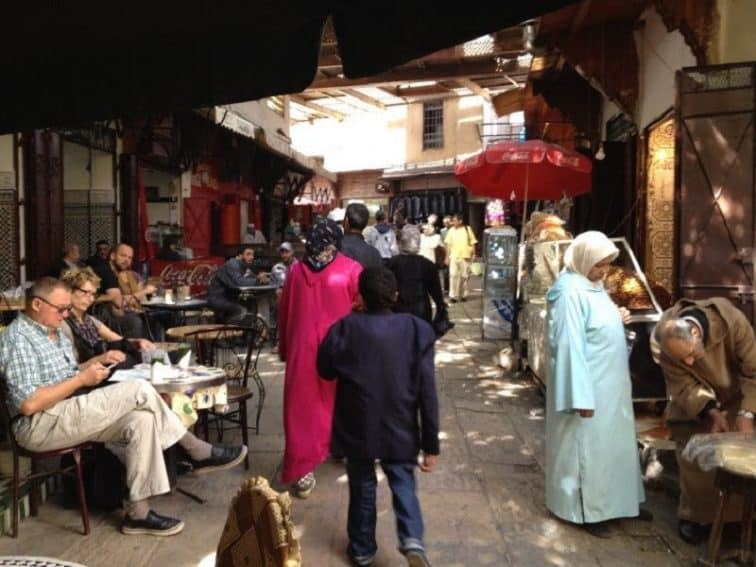 The souks are full of great food, entertainment (often from musicians doing wonderful shows swirling the tassels on their Fes-ian hats), and full of locals doing their daily shopping. Being a vegetarian the markets where the meat is sold is not for the faint-hearted with donkey’s heads and other body parts of every description. However, the rest of the markets are an absolute Aladdin’s cave of enjoyment. Now the haircuts …extremely professional, best men’s haircuts in the world. When we were wandering the streets, we couldn’t believe all the men walking along with such slick and perfect haircuts. My partner, John, decided to take the plunge and we were very impressed. Nothing is missed; ears, noses, eyebrows it’s the full package. Our barber was randomly picked in the markets, but from the look of the locals, anywhere will give you a great haircut. Cut-throat shaves are also available or beards that are trimmed to perfection. They are worth traveling to Fes just to have this men’s deluxe stlying sessions. We have tried haircuts all over the world and Fes--you’re the best for men’s haircuts in the world (according to us!) They do seasoned travelers like John to super hipster styles for the younger males. Not to be missed in Fes. Fes is a town in Morocco in Northern Africa. If you’re traveling to Spain or Portugal, Morocco is an exotic stop just a short flight from the Iberian Peninsula. We are so glad we added the destination to our trip as it proved to be the highlight of our adventure. Moorish, veiled, urbane, spicy, deserts, camels, centuries of wisdom and a new world of experiences. We flew into Marrakesh, another wonderful destination and then a short flight to Fes the following week (about 1 hr). We completed our triangle with a grand taxi to Casablanca for about $35US but trains are very economical at about half that price. 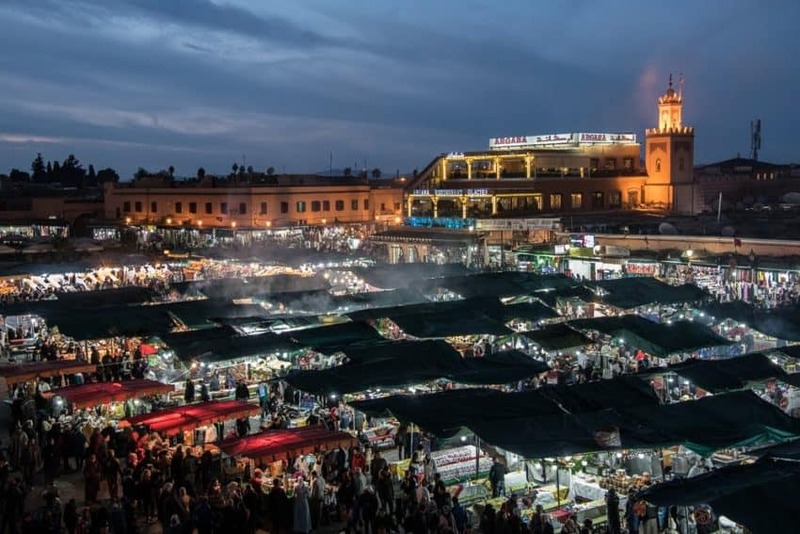 You can get direct flights from Portugal or Spain to Fes, Marrakesh or Casablanca with airlines such as Air Portugal, Ryan Air, and Royal Air Maroc. Flights can be as short as 1.5 hrs from Europe depending on your departure city. The skyline of Fes at night. Donnie Sexton photo. Cheap airlines like EasyJet also have flights to and from many other European destinations like France, UK, Milan, Paris, and Geneva to Morocco. Our visit was during Eid and this was an amazing time to be visiting. Unfortunately, there were no goats or sheep safe in Morocco during that time. Many passers-by had a goat or sheep slung over their shoulders or being pulled along in carts to every home in Morocco for a family feast to celebrate Eid. Many bargains were offered last minute for locals desperate to purchase items to spoil family and friends over the important celebration. Being such an open and hospitable people, we were often asked to join families in their celebrations. Eid is an interesting time, but it does cause some difficulties when traveling as many things are closed during the holiday. January and February are great times to visit away from peak tourist times, but any month has its own advantages. I like to avoid June and July as it tends to get a bit too hot, but if you love the heat then it’s a year-round destination. I love dancing, and Fes didn’t disappoint! Dancing and music are very much part of traditional life and you could be lucky to stumble on a street dance procession. If not, there are often cultural shows performed at the local hotels. The hotel shows cover a range of dancing styles and it’s a great night watching the veils, colors, silks, and twirling. We had a dinner and dance and they asked for members of the audience to come and be part of the dance. I had lots of fun dancing the night away in Fes! 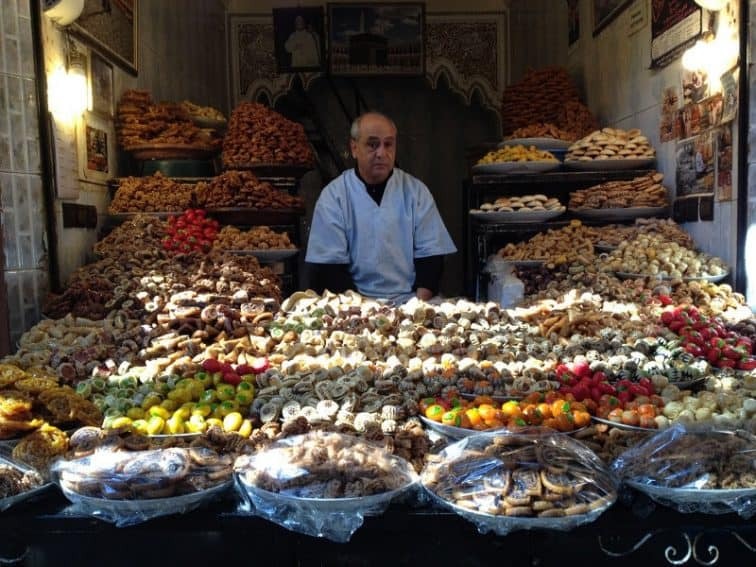 The medinas in Fes and Marrakesh are a maze of tiny alleyways enclosed with tall, enclosed stone walls. It was designed to confuse invading armies and often confuses tourists. Each Medina has a mosque and an area where the daily ablutions are performed, and food and markets as well as living areas. Inside the medinas are great accommodation choices called riads. 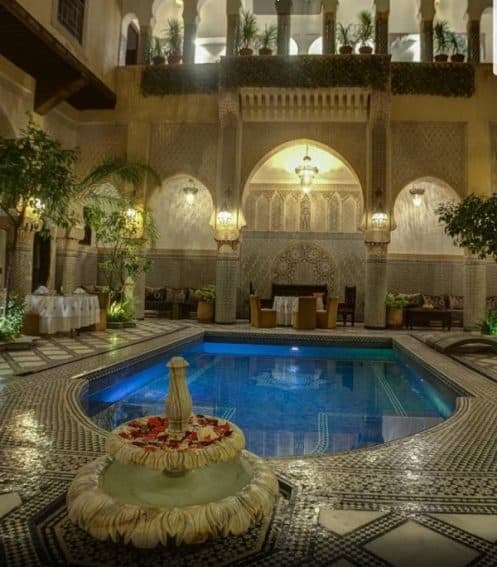 I think it’s always best to stay in a Riad (think exotic Arabian hotel style home stays) rather than the big hotels around the perimeter of the Medina’s when in Morocco. That way your right in the action, in living history and they are sensational. You go from hot, dusty, busy streets then step into an oasis of calm with water features everywhere! 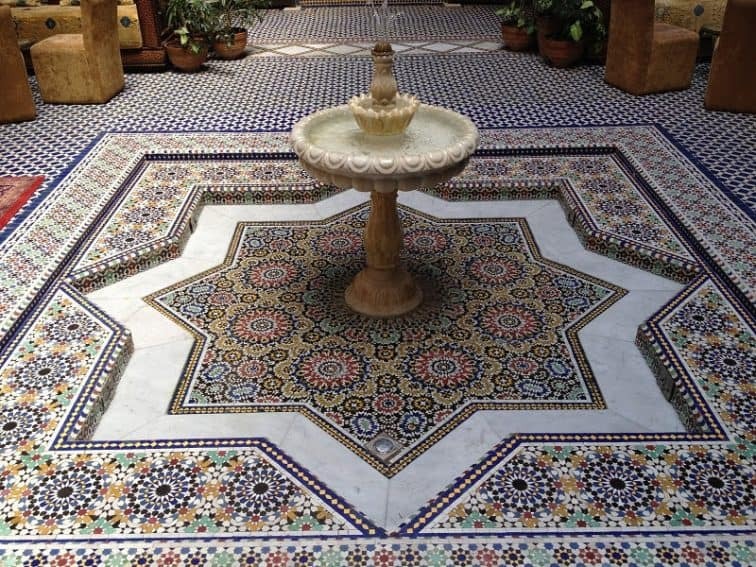 Our accommodation in the Medina in Fes was like an oasis with running water, fountains, mosaics and colors and tastes typically Moroccan. They often have huge wooden doors that you bend to enter with no indication of the beauty hidden behind the walls. We stayed at Riad Salam Fes. The Riad Salam was definitely 5 stars but really affordable. Junior suites are about $150 US. Seems that if you stay more days it gets a bit cheaper. There are lots of choice of great Riads and they are just spectacular. We were upstairs and each room was decorated with stained glass windows making the light display very beautiful. Delicious breakfasts, and the short walk to the markets, so very centrally located. Can’t recommend staying in the riads enough, they take you to another world. So take the plunge, Morrocco and especially Fes is an exotic trip and the memories will stay with you forever, and you really do need a haircut don’t you? 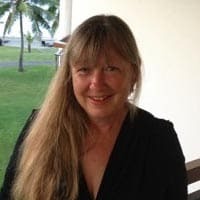 Kim Ward started her travel adventures as a backpacker traveling through Asia before starting work as an International flight attendant with Qantas Airways. She is a freelance travel writer and teacher and is always looking forward to the next adventure! That’s smoking hookers? Not good for business.